I love this game, but mostly because I love Disney. I have a few suggestions to create more game flow. Lives should be increased, the amount should be more or they should replenish faster. Diamonds are not earned easily enough to use them for lives. They’re better served for the diamond emojis. Collecting items that you already have, which then count for absolutely nothing for us, should be able to be placed in a marketplace place for other players to purchase from us so they can complete the round they need. A lot of the items need to be collected 9 or more times. This marketplace would encourage the coins to be spent on something other than gold emojis, which at this point is the only thing worth spending coins on. The events that take place are my favorite, however, the rounds where I don’t have any of the emojis that give double points are very frustrating. We can’t even choose which emojis we get when we purchase them, which is another problem that ties into this one. 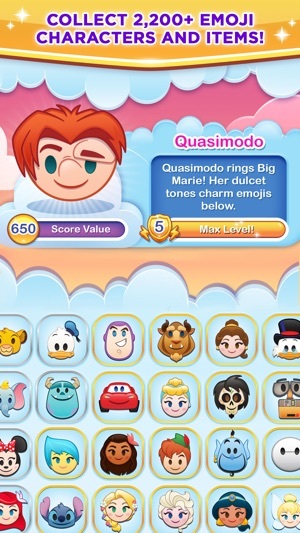 Everyone should have the option to use one emoji that gives double points, so every round should include at least one emoji that can be double points that the player already has. If we can’t choose the emoji that we want when we purchase one, we should at least be able to choose if we want a new one or if we want to get a duplicate to level up. Also, we should be able to use coins to purchase diamonds. These ideas will give incentive for players to want to play MORE. Thanks for your feedback! 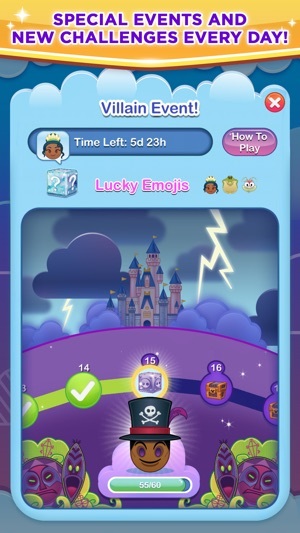 It’s great hearing what players would like to see added or changed in Disney Emoji Blitz. We’ll keep working to improve and expand. This is a fun game that provides a good mental task and test for ones mind. It does help offer mental agility for all that play because it offers you multiple options to choose to reach a personal best or high score. My only thing I don’t like is when you are in mid bonus round if you are offered to pay extra to continue, you loose the the bonus round gifts regardless. If you are given two free plays and you’ve played 1 and pay to continue ... you loose the 2nd free play. Or if you’ve just received both free plays and pay you still loose both free gifts of play. That’s wrong. It also seems to take seconds away when you pay the 20, 30 & 40 coins to continue. I’ve counted with the extended play and it passes faster than the regular play routine true normal seconds count ??? That’s my only displeasure with this app! Otherwise it’s a wonderful app and offers a good mental challenge for any age group As well as offering different challenges that constantly change to keep the users interested and wanting to continue return to play to best their time and score with the multiple types of game styles offered in general or classic play. 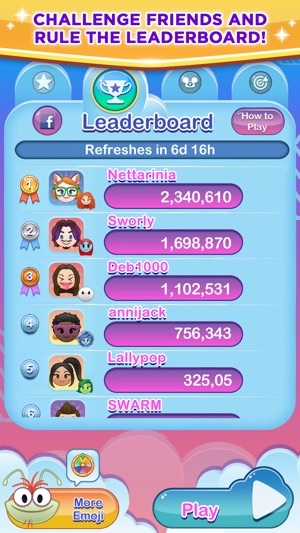 Then their monthly challenges that are set up for the players to set their skills up against other players on the web and friends that add an even great excitement to the ability to beating ones score weekly. 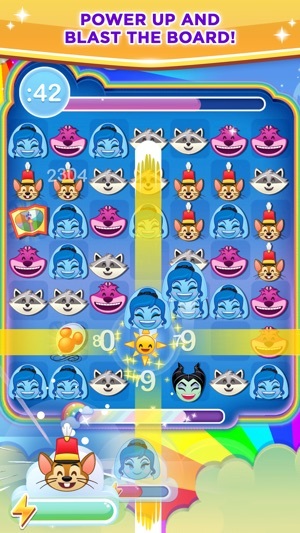 This is a wonderful game for the Disney fan in all of us. It’s a simple, fun, game that’s great to play when you have a little down time, or really want to advance a few levels it one sitting! 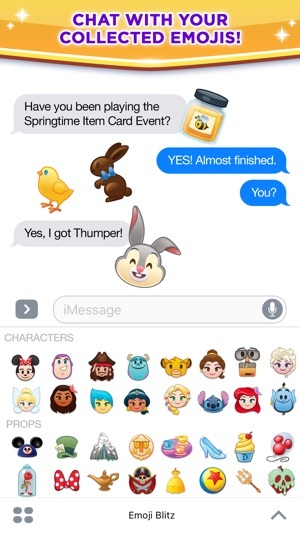 The nice thing is you don’t just get to play the game, you get to win emojis of your favorite Disney peeps! They then act as stickers you can send in texts and posts and whatnot. It’s been a game I’ve enjoyed for almost 2 years, and continue to enjoy as they have new challenges all the time! It’s the only game I play on a regular basis!